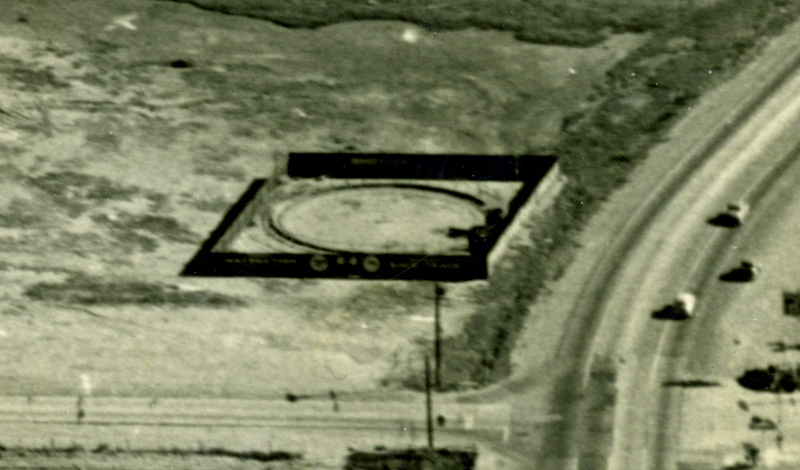 Today’s image is taken from an aerial survey of the Southern California coast from Long Beach to Seal Beach done by the Navy’s Bureau of Aeronautics. Not many people today realize that Seal Beach once had its own airport. Some locals still remember the air field personally, but, for the few Seal Beach residents who have only heard about it, the exact location of the airport seems to be a confusing mystery. Some mistakenly believe the airport was located close to First Street and Pacific Coast Highway, probably because The Airport Club (later known as The Marina Palace) once stood at that intersection. At first glance, this photograph adds to the confusion because none of the buildings in its 1943 landscape survives today to offer familiar landmarks for reference. With a little labeling, it’s a now a little easier to place the airport’s location into our modern landscape. 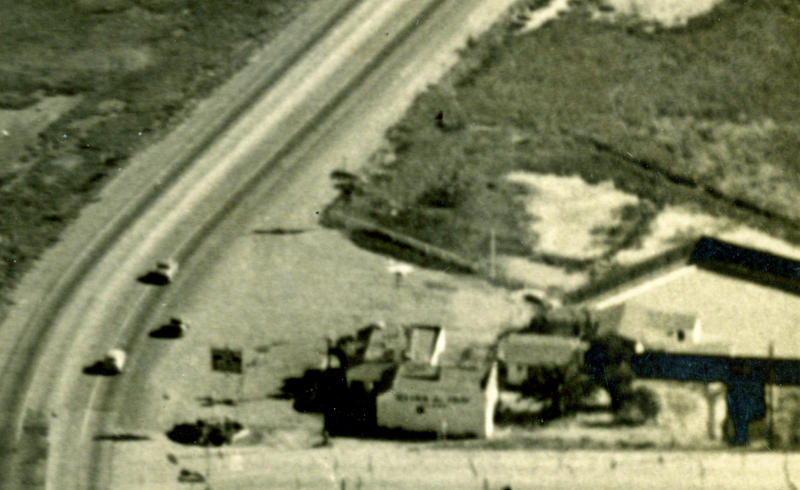 The airport once stood at the corner of Seal Beach Boulevard (which was known as Bay Boulevard until 1970) and Pacific Coast Highway. This is the same corner that was highlighted in our earlier post, Where The Buoys Are. To put the photo into a wider historical context, the United States was at war, and the attack on Pearl Harbor was still a current event, having taken place a mere thirteen months earlier. 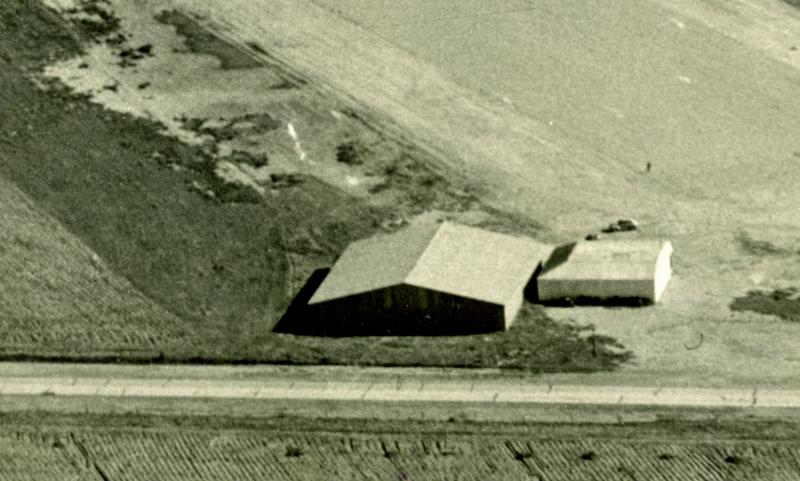 By November of the year after this photo was taken, The Naval Ammunition and Net Depot at Seal Beach would be commissioned at this location. I don’t have any hard proof that this aerial survey was a factor in Anaheim Landing being chosen for the depot, but it’s a likely possibility. A closer look at the airport reveals a small lone figure standing at the edge of the landing strip and a vehicle parked next to one of the airport buildings. It’s impossible to pick up the writing and symbols on this enclosure. Perhaps some advertising for travelers motoring down the Southern California coast? As for the enclosure itself, it might be a fuel dump. Is there anyone out there from this era who can confirm this? By magnifying the details in the original photo, we get a rare glimpse at The Glide ‘er Inn at its original location. When the Navy took over Anaheim Landing in 1944, The Glide ‘er Inn moved to Pacific Coast Highway at 14th Street in the building where the Mahe seafood restaurant is today. A small airplane from The Glide ‘er Inn days is still suspended above the building, a memento of the building’s historic past. 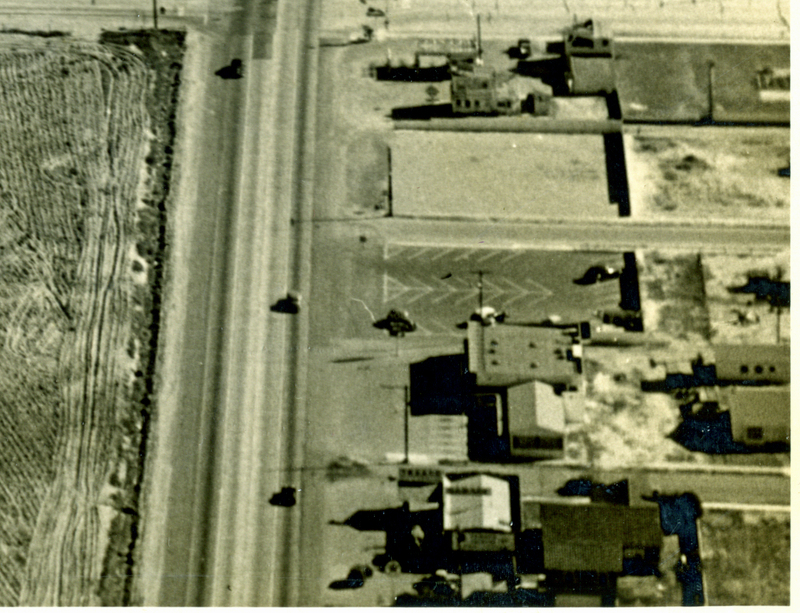 Here’s more detailed view of the businesses and buildings along Pacific Coast Highway between Bay Boulevard and 16th Street, including a gas station where Bay Liquor stands today on Seal Beach Boulevard and Pacific Coast Highway. One last bit of trivia connected to the Seal Beach Airport. Why was the Airport Club called “The Airport Club,” even though it was located at the other end of town? The name makes more sense when you consider that the club’s original location somewhere on Bay Boulevard was much closer to airport. 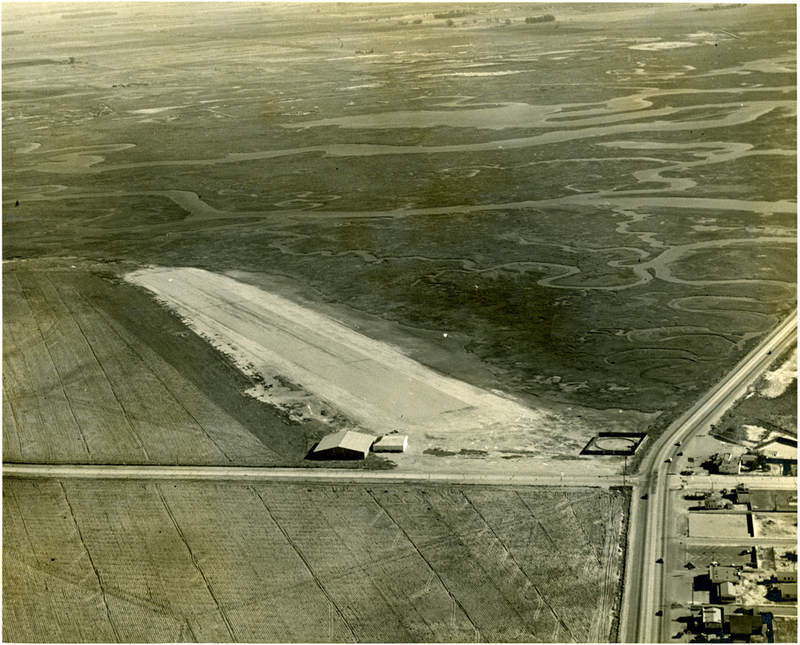 For more pictures and anecdotes about the Seal Beach airport, take a look at Libby Appelgate’s History of The Seal Beach Airport.at The Sun News web site. This entry was posted in Seal Beach History and tagged 1943, Airport Club, Bay Boulevard, Glide 'er Inn, Glider Inn, Naval Weapons Station, Pacific Coast Highway, PCH, Seal Beach, Seal Beach Airport, Seal Beach Boulevard. Bookmark the permalink. I think that round object on the corner of PCH and Seal Beach Blvd. aka as Bay Blvd. was a gun emplacement just as they had at Bolsa Chica on the bluff. During WWII we thought the Japanese were coming in their submarines all along the Pacific Coast. I don’t know why it is enclosed but it looks as if it was camoulflaged or hidden until the navy moved here in 1944. The barrier was probably removed when they might have had to use it (which was never, around here.) I heard that the guns were set on this turn table and it rotated around to get the best shot. I found out that the round race track is for Thimble Drome midget race cars that people raced in the 1940’s on property that was probably owned by Hellman Ranch here is Seal Beach. I miss the Glider Inn. In it’s hey day, it was great. I can still taste their halibut, swordfish and sole. Now, oh well. I have to give the new place a try next time I’m in town. I bought a color print of the Glider Inn yesterday in Sarasota, Florida. I would be pleased to send you a picture of it. That would be lovely, thank you. Now if we could find out how it ended up in Florida.